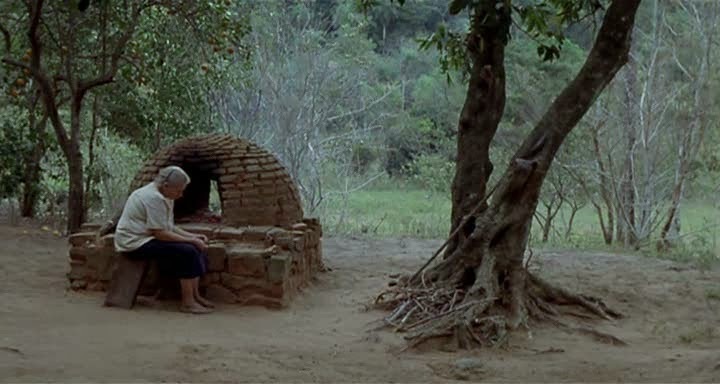 Paraguayan Hammock consists of only about a dozen static camera positions in which we see the daily life of Ramon and Candida, an elderly Paraguayan couple who live in quiet isolation farming in the jungle. 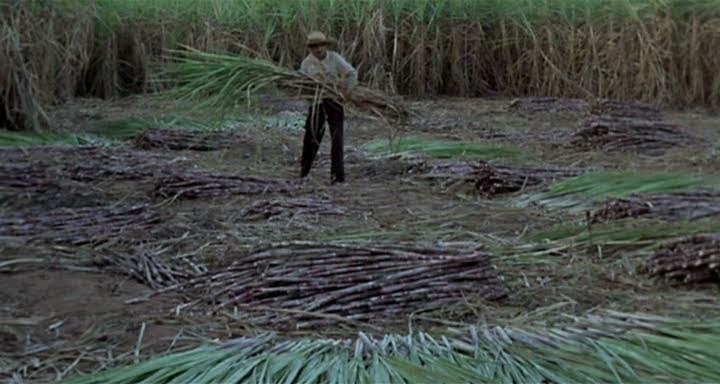 The film opens with a 15 minute shot of Ramon and Candida setting up and sitting in their hammock at dawn. Thunder grumbles in the distance. They complain about the heat and the incessant barking of their son’s dog. We slowly trace the source of the tired melancholy that hangs in the heavy pre-storm air: their son has left to fight the war against Bolivia. The war ended a couple days earlier. Their son has not returned. Ramon and Candida both know from separate encounters that their son is almost certainly dead, but neither tells the other. The camera keeps us at a distance that prevents us reading their expressions. 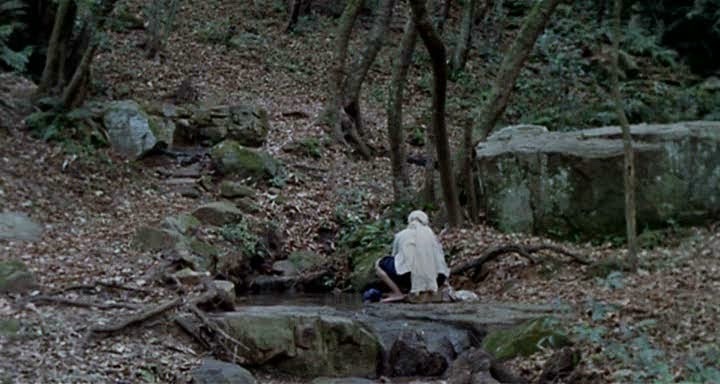 Our only hints about their monumental struggle to cope come from dialogues that play over each scene, not necessarily synchronized with what we are seeing; several are heard while we watch Ramon or Candida working alone and in silence. We overhear audio-only flashbacks, perhaps memories or even just thought conversations. 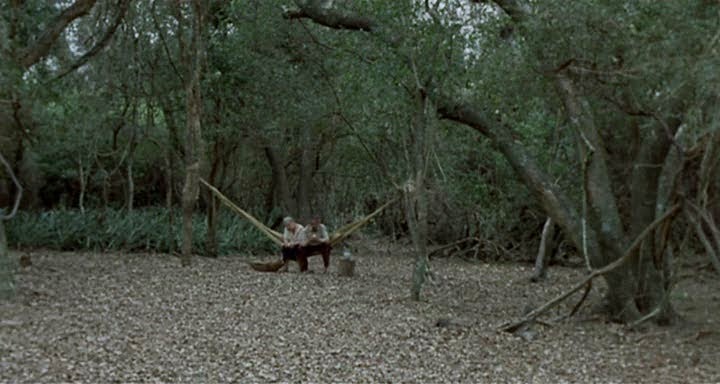 The film ends on another 15 minute shot of the hammock, this time at dusk, as Ramon and Candida implicitly make the decision to go on living, content with only each other’s company. In the heartbreaking final moments of darkness, we hear the rain begin to pour. Minimalism is one of the hardest things there is to do well. 98% of the time I think it comes off as lazy and, more importantly, uninspiring. To make it work you have to take something simple, small or brief and reveal within it something evocative, profound or unexpected. This can often times mean more work, more thought, more discipline and discernment than classical art and on top of that you also need a touch of alchemical magic. And even then it probably isn’t going to work for everyone. I think Paz Encina’s experimental Paraguayan Hammock is one of those rare works that does what minimalism should do. A handful of long takes over the course of a single day and a sampling of conversations tells us everything we need to know about this family: who they are, how they live and what they are going through. The soundscape of thunder, barking, labor and voices cycles with careful precision, allowing us to enter into a rhythm that has been playing long before the camera started rolling and will continue long after it fades to black. Though Encina’s images are crafted with an exquisite grace and a keen eye for natural lighting, the mood is largely an aural creation and it mounts to an emotional crescendo that is superbly capped off by the breaking of the storm. It doesn’t come naturally for me to adjust myself to the pacing of Latin American peasant farmers, and I admit to moments of impatience, but the cumulative result is rewardingly moving.